First year with my Kodabear, and was wondering any tips on vegetable garden beds with Siberians? I know my tomato plants will have to be planted in the front because of the poisonous nature of their leaves. Any other tips and thoughts much appreciated. We have a raised garden it is about 12 inches up and they we put wire cages around each plant and extra wire fence around the garden. My one pup eats the peppers and jalapenos lol. I had to make an enclosed garden with chicken mesh and a gate to keep ours out which works really well. I had some strawberries in a planter and Milla stripped them bare, so they are now behind a fence as well. Any new plants we put in have to be fenced off until they are established as they seem to love play seek and destroy any new plants that mum puts in. So, I am thinking cayenne pepper spray will not detour him. lol. 18 inch boarders to start however, I have a feeling that chicken wire fencing is in my near future. Thanks for the advice. We also had to put fencing around any vegetable and fruit gardens. We set up about 3 foot wire fencing because Lycus would eat just about everything on there lol. Good luck! I set up a raised garden bed in my backyard. I set up a wire fence around the walls of the garden and he still would jump into it. So I ended up putting cross bars crisscrossing over the garden and that finally kept him out in conjunction with the wire fence around it. My tomato plant he never bothered, it was inside a wire support frame and covered in a mesh wire to keep the birds out. Thank you did not realize you had one. and thanks for the pics. Anyone do gardening besides veggies with huskies? I noticed Loki didn't like a new plant I just planted and tried to remove it. After some correction he left it alone and has continued to leave it alone. I believe he loves my roses like I do as he watched me deadhead them and he likes running through the petals. Is this just self denial? Right now Loki at most is left in back yard for a minute while I watch him from kitchen window. 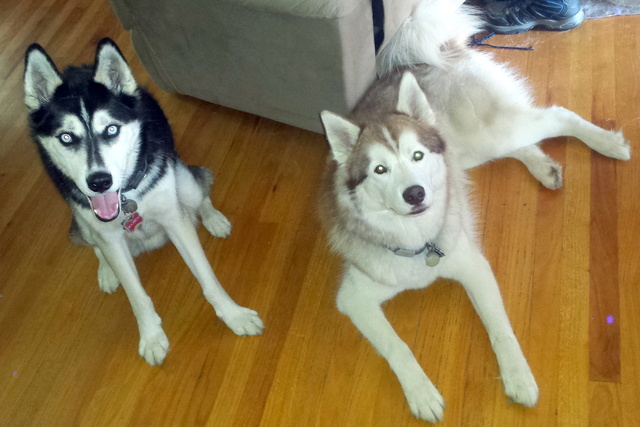 Has anyone tried to landscape/garden for huskies? I noticed he really liked under my pine tree. So, I was thinking of planting a tree for him and then putting a sandbox by the dripline where he could dig and I'll bury toys for him. Then, teaching him that is his area to relax and leaving a level spot to put his kiddy pool. I was also going to line it with lavender or something similar so he smells pretty. Is this crazy? I don't think that's crazy at all! I know huskies are notorious "landscapers" but I have been repeating Orion Off the Garden since we brought him home - so far he hasn't been too bad and he is home alone in the backyard from 8-5 on weekdays. The one thing he has destroyed however is my lavenders, the silly boy likes to roll on them and he loves my roses too... he definitely loves to prance away with pieces as I am pruning them! I know Orion hasn't entered his horrible teenage phase yet so I am guessing my garden will come under siege then but i'll keep my fingers crossed that my flowers are safe from my dog. I thought Orion might like a spot in the garden too but I soon realized his spot is wherever I happen to be so I haven't bothered with that yet but that may change as he gets older and no longer feels he needs to shadow me. Anyone do gardening besides veggies with huskies? So, Crap. Just found this thread (see what happens in dense fog, heavy snow, husband at work? I use up most of our data cap (satellite internet all that's available in the boonies ) and now I find my deer solution for the landscape may be the evil of my vegetable garden?!!? Wonder if I can harness that digging energy - we have rather heavy soil up here. My piddly, rickety 4' chicken wire fence did nothing to deter the deer - do you think it will keep Mr. Dog from "inappropriate" digging? Or am I going to need to put a loop of invisible fence around that, too? 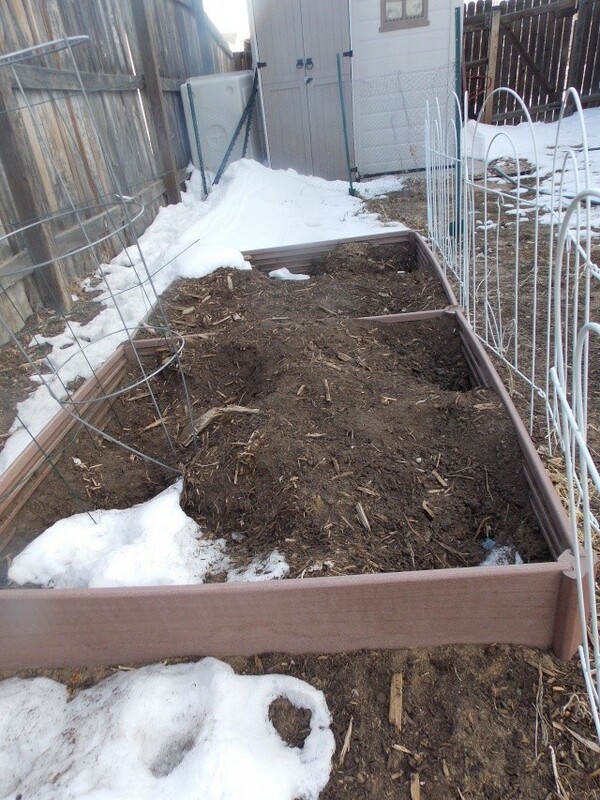 I'm also worried about the compost pile - we drink tons of coffee so there are lots of coffee grounds in there as well as lots of onions and garlic skins (I grow my own garlic so there is a whole bed of the stuff.) Ami is supposed to keep me company while I garden and also supposed to keep the critters away - now I learn he may be a critter, too Good thing he's so cute! I guess I am going to need to get a gate to put across the balcony to seperate the plants from the pup. During the winter all of them were in my second bedroom, which I call the plant room. (I have plant lights on timers and keep all of my tropicals happy during the cold months) so Journey is just now discovering all the goodies I have. During the winter the "were"...does that mean you're done with winter? I'm figuring on setting up some lights to start seeds the end of this month! Fortunately, Ami won't be able to get to them. What do you use for bulbs? Ha ha, yeah... pretty much. I live down in Mississippi. It will get cold a few nights here and there but I can just bring them in those nights.. I bought a sqaure LED plant light and I also have just the regular plant light bulbs you can get from Lowes. I just hook them up to a timer and make sure they are at least 1-2 feet away from the plants. Both dogs have been out to the patch with me - very small garden, probably 15 x 12 that's all my back could handle - both have stepped out onto the dirt I've turned over once - a quick "ah ah" and they backed off and that was the end of that. Contrary to my comment in another thread - we're getting a good soaking tonight, good, means I won't have to water tomorrow as well as getting some water back in the tanks! I've yet to figure this out, Avalanche doesn't act like he's really afraid of the lightening / thunder but he sure makes like a velcro dog when we've got a light show! Amy, could you put the educator on and train him to avoid the area the same way you did with the pool and the counter surfing? MY garden area is chicken wire around and the tomatoes are in the wire cone shape stands. Gonna try and make it in a different area this year. (If I get moving in the next few weeks.) I am gonna eventually do a raised bedright next to the deck with chicken wire around it. My yard looks like a mine field went off. The only way to have a garden is a fence. If I cage individual plants they will dig around them and poop around them. Right now my fence is rather flimsy since it's just plastic on a handful of posts with zipties. Going to put in solid wood or wire with wood frame when I have the money. Some of my dogs are smart enough to know where they can flip the plastic out of the way and I have to yell at them to get back out of the garden. I planted strawberries outside the fenced garden area and Niji was grateful for me loosening the soil and covering it in this fun straw for digging. After a few holes and replanting a couple strawberries I surrounded the patch in wire I use to build rabbit cages at least until the strawberries get established and there is no loose dirt and straw. She isn't interested in the areas that have thick plant growth.